1) Miller, W.H., et al. 2013. pp. 4-7. Muller and Kirk’s Small animal Dermatology 7th ed, Elsevier, St Louis. 2) Diaz, S.E., Torres, S.M., Dunstan, R.W., et al. 2004. An analysis of canine hair re-growth after clipping for a surgical procedure. Vet Dermatol 15:25-30. 3) Diaz, S.E., Torres, S.M., Dunstan, R.W., et al. 2004. 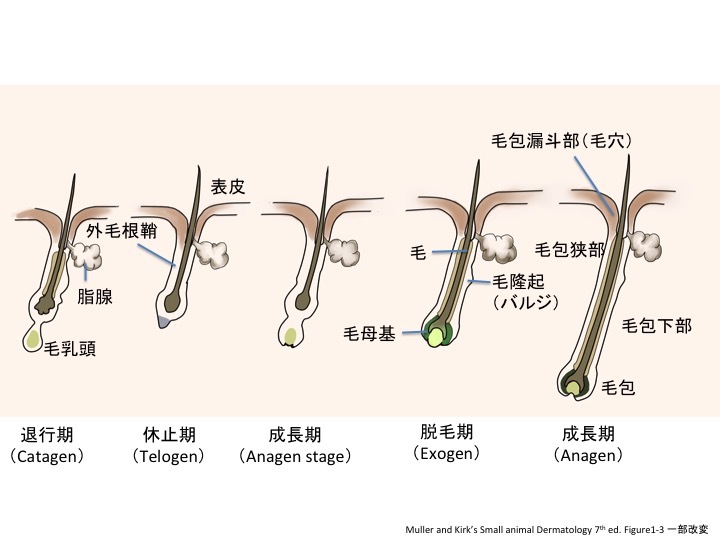 The effect of body region on the canine hair cycle as defined by unit area trichogram. Vet Dermatol 15:225-229. 4) Gunaratnam, P., Wiklkinson, G. T. 1983. A study of normal hair growth in the dog. J Small Animal Pract. 24:445. Copyright 2019 さいたま市浦和区のよこやまペットクリニック. All rights reserved.